Nero 2014. Ultimate standard in multimedia. Nero 2014 is the ultimate standard in multimedia software, allowing you to manage, create, convert, play, and burn your movies, music and photos for the best entertainment experience at home or on the go. 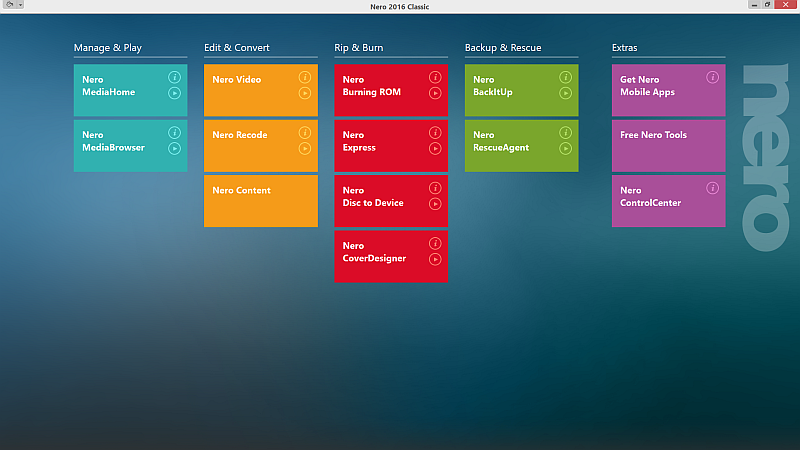 Nero 2014 lets you achieve results fast and easily with fully integrated applications throughout the suite. Best ripping and conversion, all-round mobile device support, powerful and user-friendly express and advanced video editing, full media management, superior disc and file playback including dvd-video and avchd, unique nero play to tv streaming, and best burning, makes nero 2014 your companion for all your multimedia needs. Nero 2014 is an utility that works under windows xp, windows vista and windows 7. It supports both 32-bit & 64-bit windows editions, therefore it could run faster on 64-bit computers. Estimated download time for Nero 2014 on a common adsl connection is Six minutes. Version 15.0.02400 was released two thousand forty three days ago by Nero AG. Click the green download button to download it now.